I would like to introduce you to this beautiful creature, who is full of elegance and kindness. This black perle who attracts everyone attention and for me my biggest passion. 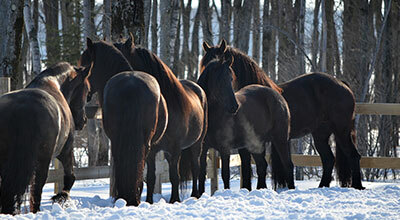 Since I was little I have always dreamt to be able to offer friesian in Quebec of different types and origin. I want to offer my services to the fullest of my ability. So today I give you the opportunity to discover the friesians …. I wish you a wonderful visit ! I starded with a young foal (Brutus) who I wanted to castrate for competition in dressage. My goal was to have a powerful and well blanced horse, which is needed, for this type of discipline. My goal was met more than expected when he obtained the first primi, in Kempterville keuring of 2008 that only 5% of friesians can obtained in such an evaluation. From then on I change my perspective on what became our new passion. 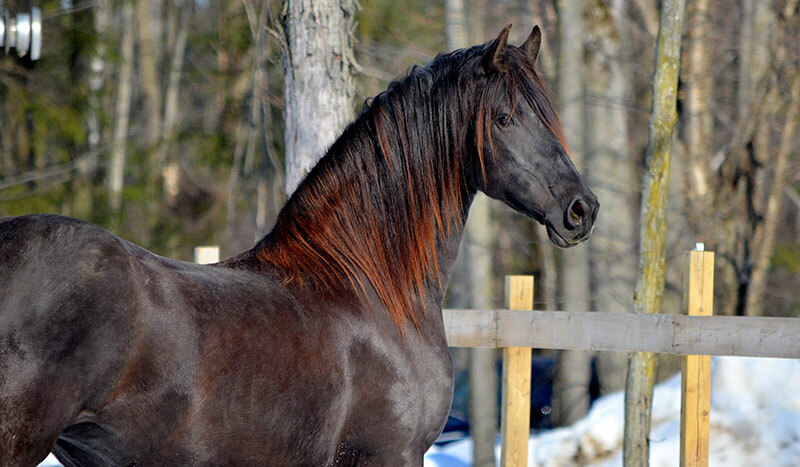 I decided at that moment that Brutus could become the first reproductive stallion approved by FPS/FHANA in Quebec. A few months later, I imported Annie Richstje W. of San Francisco who was the same age as Brutus. Once it was time to separate the two the idea of breeding was born. This breed that is very affectionate and intelligence became something I wanted to offer to others. Later came Nancy S. of Oklahoma who was the start of our herd. I also imported two beautiful mares to give different varieties of friesian. Therefore I am excited to continue growing. Soon several services will be offered ! 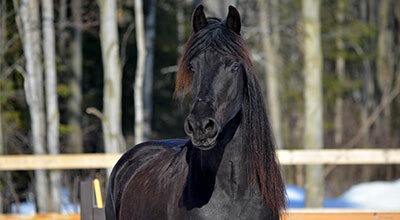 The black Friesian breed of horse is one of the oldest domesticated bredds in Europe. It is native to the province of Friesland in the northern Netherlands. During the 16th and 17th centuries the Arabian and Andalusian blood was introduced to lighten the breed. This has give them the high knee action, the small head and the arching neck. The Friesian horse has been kept free from influence of the English Toroughbred. The Friesian was used as a war horse bu Friesian soldiers fighting with the Roman Armies, and later was used by knights and traveled all the way to the Middle East with the Crusaders. Their suppleness and agility made Friesian sought after in the riding schools of Paris and Spain in the 15th and 16th centuries. With industrialization and the increase of mechanization on the farm and in transportation, the Friesian horse was very close to extinction. In fact, prior to World War I, the number of Friesian stallions was reduced to only three. The Friesian was saved from extinction by a group of dedicated breeders in Friesland, a northern province of Holland and through the rigorous efforts of the ”Het Friesch Paarden-Stamboek” (or FPS), the official Duch Studbook, the purity of the Friesian horse was preserved. The FPS is one of the oldest breed registries in the world having been established in 1879. Breeding of the Friesian horse is still done under strict guidelines such as selection, performance, testing and classification to ensure that the quality of the breed remains very high. 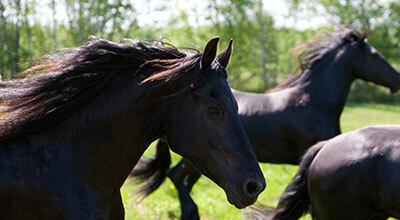 The Friesian is, by nature, a talented show horse with its shiny black coat, flying mane and tail, and high knee action. The Friesian’s beauty, size, rideability, and temperamenet make them a perfect choice for the whole family.